Haven’t we all wanted to be in the middle of clouds, feel the crazy wind and look down upon the world where we stay? Well, Gurgaon’s Flyboy Air Safari is fulfilling that very wish for us. At Flyboy, the aim is to give you an experience which makes you feel like you’ve grown wings. However, the equipment use is top notch to make sure that your paramotoring experience isn’t just fun but also extremely safe. They have different packages that vary in terms of the time spent paramotoring. It starts from three minutes and can be extended to 24 minutes. And this great experience comes at prices starting at just INR 1,599! As you’ve already guessed, the aim of Flyboy is to give you a very unique experience. 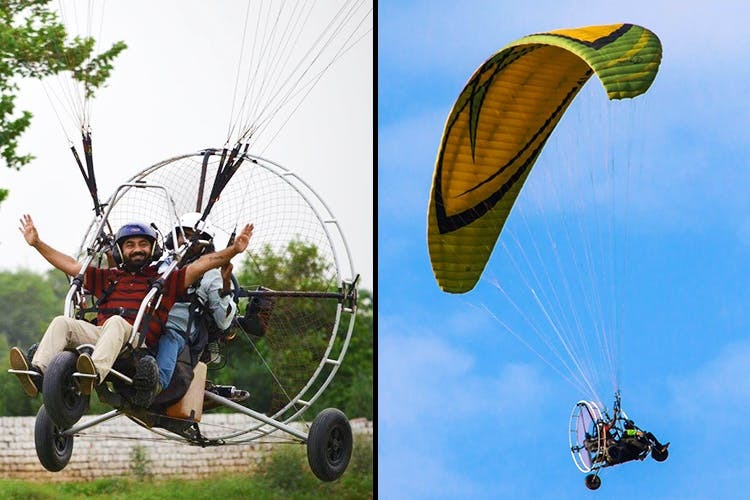 Flying through the clouds while paramotoring is a grand experience in itself but they also would love to make your celebrations grand. Have a message for a loved one? They’ll deliver it for you. Want a flower shower while proposing? They can do that too. Into photography? They’ll assist you with taking some stellar aerial shots. We all should go get ourselves an experience as unique as paramotoring at least once. And to know that such a facility is available right in the city means we should get our tickets booked right away!